The 41st Hong Kong International Film Festival took place last night at the Hong Kong Cultural Center with the Pang Ho Cheung directed LOVE OFF THE CUFF (CHUN GIU GAU JI MING)'s world premiere opening. Pang Ho Cheung led actors Miriam Yeung Chin Wa and Shawn Yue Man Lok, Paul Chun Pui, Susan Shaw Yam Yam, Derek Tsang Kwok Cheung, Isabel Chan Yat Ning, June Lam Siu Ha, Matt Chow Hoi Kwong, DaDa Chan Jing and Stephanie Au Hoi Shun. 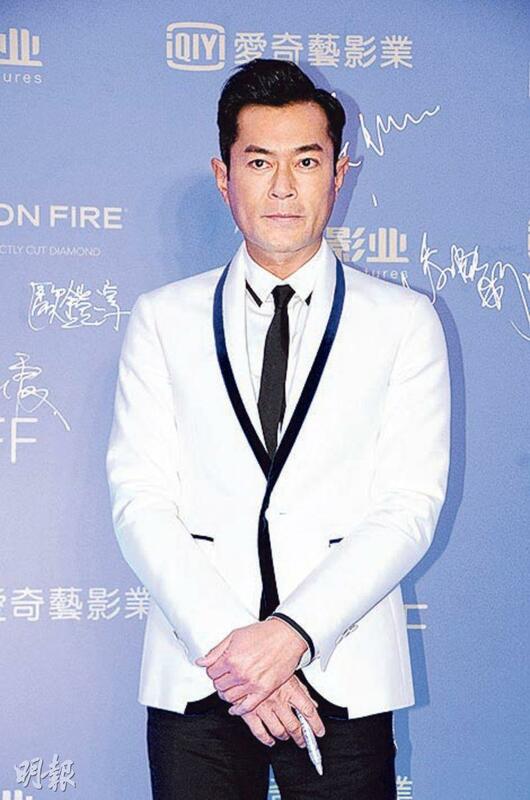 In addition, film festival ambassador Louis Koo Tin Lok, Charmaine Sheh Sze Man, Irene Wan Bik Ha, Mark Lui Chung Tak and his wife Leung Ka Yuk, Elena Kong Mei Yi and other guests attended the opening ceremony. The Hong Kong International Film Festival Association president Dr. Wong Ying Wai last night host the film festival unveiling ceremony with Commerce and Economic Development Bureau secretary Gregory So Kam Leung. The 15 day long film festival will screen 230 films from 65 nations and regions. 69 will make their world, international or Asian premiere. 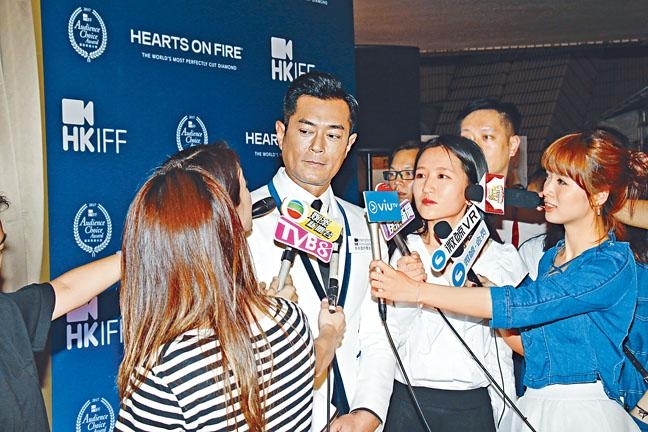 Already the film festival ambassador for the fourth year, Koo Tin Lok felt that film professionals should support Hong Kong film more. He felt that Hong Kong film still had a lot of creative space. Speaking of very little film funding in recent years and some actors even worked for free, Goo Jai said that he tried to take very little salary or even not at all. He felt that the most important was the film was good. An actor should not care about the film budget or how much market it would have but making a good movie. Recently Stephy Tang Lai Yun was rumored to have join Goo Jai's company One Cool Film after her Sun Entertainment contract came to an end, and the company would turn her into an action actress. Goo Jai said, "Thank you, no comment." Then he put down the microphone and walked away. Earlier Yeung Chin Wa and Yue Man Lok were guest presenters at the Hong Kong Film Award. Later Chin Wa revealed that Lok Jai was very nervous when they went over the scripts. They went over their 20 second long script four times. Lok Jai explained that the script changed and was a little complicated. He was afraid that he would not able to follow the cues. Chin Wa said, "It was only 20 seconds." Lok Jai said, "To me it was very long, I was afraid of misreading the film titles because our part already had a video error. If I made more mistake more mistakes would just keep coming." Chin Wa said that she did not see any error and even praised Lok Jai as very professional. Would Lok Jai be interested in hosting the Hong Kong Film Award? He said, "Absolutely not, did you see how Cheng Chung Kei had to do everything? However no one would have been able to perform so well. I know that he rehearsed for two months. This year was very well done, the atmosphere and the timing were very well grasped." Did Chin Wa comfort him for not winning Best Actor? Chin Wa said, "He is fine, he only had a lot of pressure when he went over the script. I said that it was just one night, not a lifetime." Lok Jai also said that the defeat really was not important. Instead he had to spend a lot of time to reply to comforting messages. He also said that his girlfriend did not comfort him either. "It's normal. She know that I can try again next time, I have plenty of chances." Sheh Sze Man said that she was very happy and honored to be able to participate in film events. Would she focus on film from now on? "If I have the chance I would want to. In the film industry I am new. (Veteran rookie?) I still have to work very hard." Lately Ah Sheh has been busy with Dayo Wong Tze Wah's film DUNG DUK DUT GUNG (STAND UP SPECIAL AGENT). She said that the film will wrap up production at the end of the month. The shoot has been very smooth. The toughest part everyday was to hold back her laughter because Tze Wa was truly too funny. Lately she was caught with a hunk. Ah Sheh asked, "He wasn't Wong Tze Wa? Lately I have been with him." Later she thought and said, "Could he be my god son's Daddy? I replied to that before. (Do you have a boyfriend yet?) I will leave it to fate." 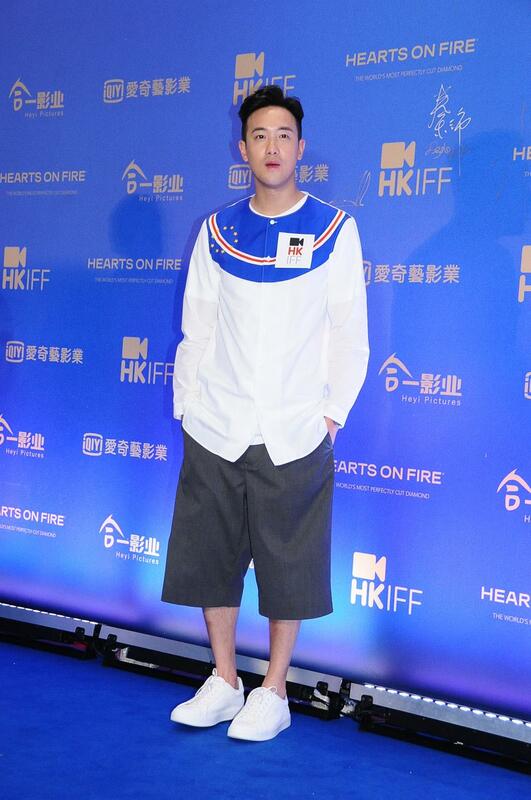 Au Hoi Shun's boyfriend Tony Wu Tsz Tung won the Best New Performer Hong Kong Film Award. Did she already celebrate with him? She said, "Originally we planned to see each other at the award show, but we were too busy. We only got to see each other tomorrow. I very officially told him congratulation, celebration dinner will have to wait." She said that her boyfriend will turn 25 on the 16th. His award was already the best birthday gift.